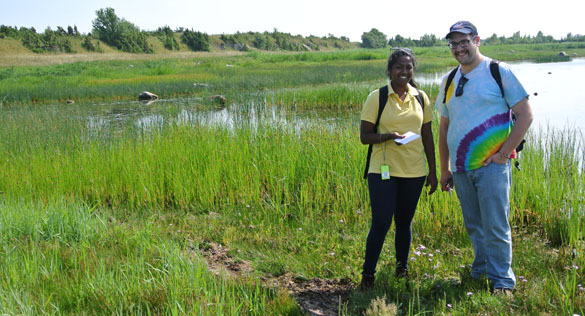 KURESSAARE, ESTONIA–The 2012 Wooster Estonia expedition had its first official time in the field this afternoon. Jonah, Richa and I traveled the short distance from Kuressaare to the historical Sõrve peninsula in the extreme southwest of Saaremaa. There we explored the Äigu Beds in the Kaugatuma Formation exposed along the peninsula’s northwest coast. I know this place well from several visits, and it was the site of Palmer Shonk’s Independent Study project. The limestone here is mostly a high-energy encrinite (a rock made almost entirely of crinoid fragments) with many elaborate crinoid root systems in place showing the arrangement of a “crinoid forest”. 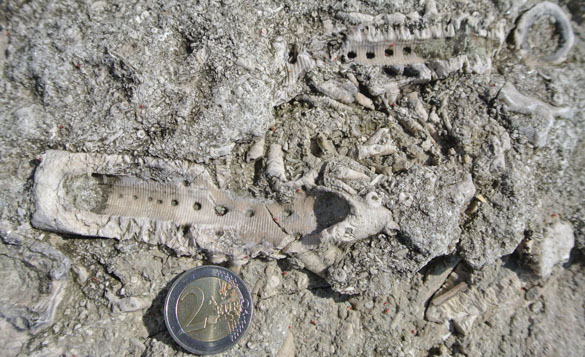 Pictured above is a limestone bedding plane with two primary axes of the roots (holdfast) of the genus Enallocrinus. The interior sediment has eroded away so that you can see the holes where “rootlets” emerged to penetrate the surrounding sediment. Richa and Jonah on the swampy northwest side of the peninsula with the Kaugatuma Cliff exposed in the background. 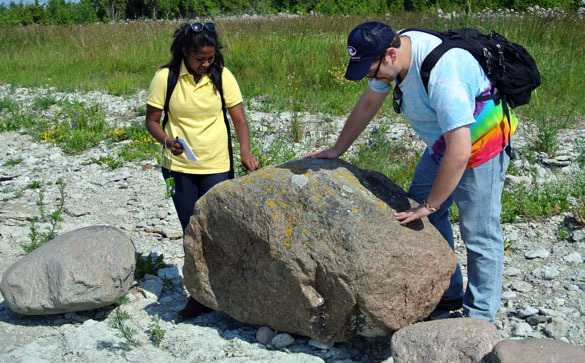 Our liberally-educated students are here examining the surface of a granitic boulder brought here from Sweden by the last glaciation and dropped as an erratic. Of course, it is not the igneous rock that excites them — it’s the multicolored lichens on it! This project is funded by a grant from the National Geographic Society and the Wengerd Fund of The College of Wooster. Tomorrow we will introduce you to the Ohio State University team members and more details about our work and goals. We are very grateful for this research opportunity. We are also very pleased with the spectacular weather. Sunny and 26°C today. I am so jealous!! I hope you guys have just as good of a trip as we did. And good luck on your projects! Thanks, Rachel! We’re thinking of you and Nick here.